We are pleased to announce Ultiworld’s 2018 D-I All-America teams. These 14 players were selected for their performance in the 2018 college season, looking at both the regular season and the full college Series, including Nationals. Please join us in honoring the best college players of this season. Also be sure to check out our Player of the Year and other individual awards from the 2018 D-I college season. 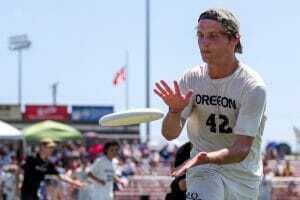 Top billing on this honorary roster goes to Ultiworld’s 2018 D-I Men’s Player of the Year: Matt Gouchoe-Hanas. 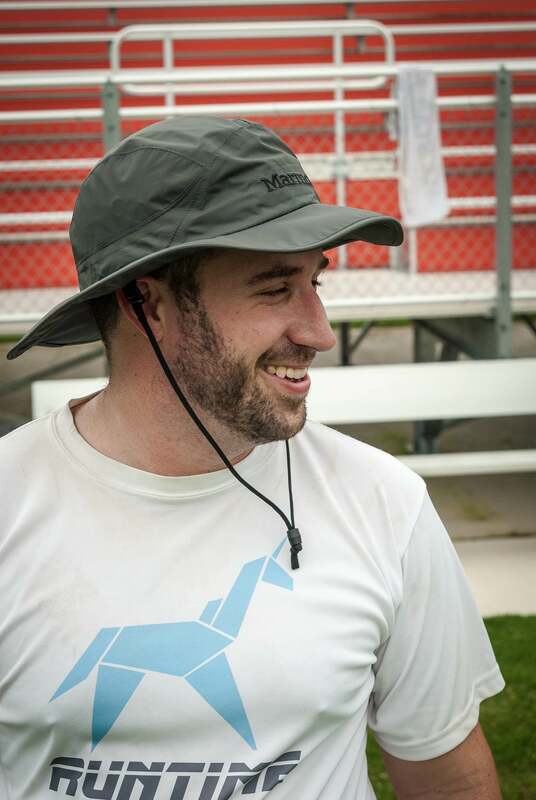 North Carolina Darkside’s do-it-all captain was maestro for his team, conducting them to a nearly flawless season and a national title. Gouchoe-Hanas was a central cog in offensive flow for Darkside, an ace defender, and the just-give-him-the-rock player who could manufacture goals in crunchtime, regardless of opponent. MGH has long had the athletic tools to hang at the top of the men’s division and in 2018 his skillset continued to codify and improve. The Player of the Year runner up, Rees is a no-brainer for first team All-American. A classic “your favorite player’s favorite player,” Rees has perfected so many of the little things that earn the respect of everyone who has tries to stop him. While his blazing speed and throwing ability stand out, what makes him so revered is how he harnesses those tools to create the little advantages that decide games. Time and time again Rees would resuscitate Oregon’s offense on stagnant points by suddenly appearing open in space or putting a pinpoint throw into a zone’s one hole. Rees keeps possessions alive in ways that don’t necessarily show up on a stat sheet, but are more than evident in his team’s phenomenal success this season. Because of the hype surrounding his experiences outside the College division — a U24 selection and a Club national title — it seems like the expectations get higher every year for Tannor Johnson. But the ZooDisc junior just keeps on delivering and pushing the expectations higher. 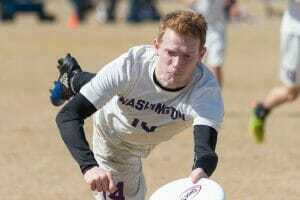 Now the reigning Ultiworld OPOTY in both the College and Mixed Club division, his offensive prowess is well-documented. He’s a two-way threat: a tall, athletic deep cutter whose wide throwing arsenal makes him equally dangerous with the disc in his hands. While he’s primarily an offensive player for UMass, he has also made appearances on the D-line to guard a big matchup and is often the player who can get the disc back on a turn for the offense. He’s the total package, and, after just missing the cut this year, will have POTY-level expectations when he enters his fourth college season. Matt Gouchoe-Hanas. Nathan Kwon. Walker Matthews. Liam Searles-Bohs. Darkside’s most important player this year could very well have been none of the above. Time and again, Elijah Long proved himself to be the most valuable and versatile asset on the 2018 national championship squad. He’d frequently match up against his opponent’s top downfield threats, earning blocks like the one against Oregon in his own end zone on double game point of the Stanford Invite semifinals. He was also one of the few defenders trusted to cross over to the offensive line after breaks and in crunch time, as he did during Darkside’s national semifinal comeback against Ego. 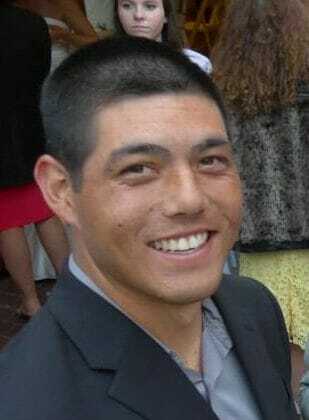 A springy, level-headed athlete, Long was one of the few players in the country capable of excelling in multiples roles. 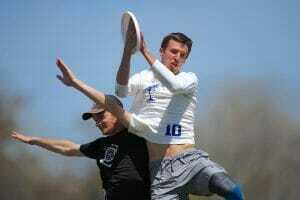 He led Darkside in assists at this year’s Championships with 16, and added seven goals, leading to the team’s best +/-. And in crunch time, Long shined, registering seven assists and a goal in UNC’s semi and final victories, and zero turnovers despite taking on the second highest volume of touches. While the Carleton class of 2020 took turns in showing off during last year’s championship season, Lanier soared to new heights this season. The sophomore showed why he is considered an offensive wunderkind, leading CUT in both +/- and assists at Nationals with 12 assists to go with seven goals. Workouts clearly paid off for Lanier, who looked stronger and faster this season, allowing him to step up as an initiating cutter and show off his smooth forehand to space. That look became the go-to for Carleton when in need of a goal, and for good reason. Lanier was also one of the few players to crossover in the rare instance that his team needed to add some punch to their D-line. 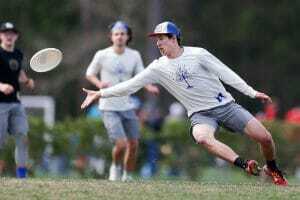 The men’s assist leader at the D-I College Championships, Benaloh turned in a superb offensive season, demonstrating not only devastating power with the disc, but versatility to boot. His ability to stretch the field with dangerous hucks pulled defenders into poor positions, creating more room for his teammates to work under spaces. 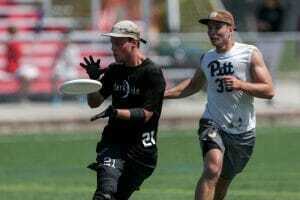 Connecting those patterns was easy for Benaloh, who could use his edge control to guide the disc to his cutters without exposing it to the defense. Sure, the Washington handler provided plenty of pop, linking up long with receivers with high frequency, and even flying from the backfield towards the end zone to get in on the action himself. But he also provided them with stability and gravity that helped make the Washington offense a smooth operation that could rival nearly any in the division when it got going with some momentum. A disappointing Nationals wasn’t enough to knock Fisher out of a place on an All-American team, as Carleton’s big man showed during the regular season why some regard him as the most talented player in the division. When Fisher is at his best it seems unfair that he gets to play against mere humans. 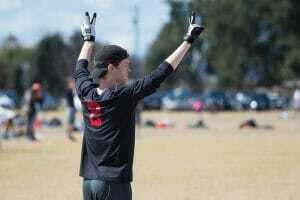 The player we saw lead CUT to victory at Florida Warm Up and Easterns leveraged a terrifying combination of size and speed into massive yardage-eating cuts, easy break side continuation, and heaps of goals. It is a shame that this version of Fisher wasn’t always there at Nationals, as he only managed seven goals and two assists all tournament and was essentially a non-factor in Carleton’s shocking capitulation to Pittsburgh in the semifinals. On the shortlist for POTY heading into Nationals, Fisher will have to settle for a second team spot as he, and the rest of Carleton, will look back on 2018 and think about what could have been. The 2018 Men’s Division Callahan Award Winner finishes the season with one heck of a story to tell. 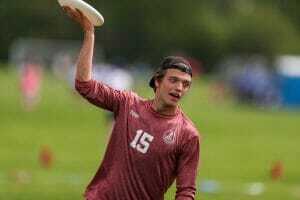 Stanford’s Gabe Hernandez did everything his team asked of him and more this season, playing himself into college ultimate lore on a torn ACL in a magnificent game-to-go to performance at Southwest Regionals. Hernandez’s heart shone through on every point he played in 2018—every time he was on the field, he put his team first and laid his body on the line in all roles: in the handler set, downfield, and on defense. As valuable as his skillset is, his can’t-stop-won’t-stop effort provided inspiration to Stanford on their march through the 2018 season. Brown’s John Randolph is the first male freshmen to make an All-American team,1 but his Nationals performance left no doubt that 2018 Rookie of the Year belonged. Randolph led the tournament in per-game +/- and led the tournament in goals in dominant fashion. He posted 25 scores in six games on the weekend, five more than the next-highest scorers, Matt Gouchoe-Hanas and Mike Ing (who also both played an additional game). While he began the season as a main driver of the BMo D-line offense, by the Series he was crossing over to the O-line to play as an initiating cutter and, most notably, embarrassing defenders once Brown transitioned into their vert stack dominator set. He’s a lightning-quick cutter with club-level throws, and showed unprecedented dominance during his first year in the division. It’s downright scary that he has three or even four years of college eligibility left. Mac Hecht is a problem for defenses. People know what he is (an elite thrower); they know what he wants to do (get the disc under and pick your mark and defense apart); they know how important it is that they stop him. But even though people know exactly what’s coming, they can’t seem to do anything about it. Through a combination of guile and will, Hecht bullied and tricked his way open all year and unleashed some of the best hucks and break throws in the division to keep the Brown offense humming. Before John Randolph started regularly playing O, it was largely on Hecht to do all the hard things for the BMo O-line, and he did them with aplomb. Hecht was one of the premier offensive threats in the division and the cornerstone for Brown as they ascended back onto the national stage for the first time in a decade. Expectations were high for the Oregon junior after a superb showing in Perth for the US U24 National Team. Lohre delivered this spring by showing off a voracious appetite for goals. Lohre isn’t blazing fast or an insane leaper, but he has enough of both to take advantage of his nearless flawless timing. His motor just kept running, legs churning out yardage and threatening to overwhelm his defender. He was one of the top threats on a deadly O-line, a blend of smarts, quickness, and skill. In an offense predicated on holding a foot down on the gas pedal, timing is measured in tenths of a second. But that’s all Lohre needed to expertly leave defenders guarding empty space as he took off for yet another clap catch goal. Followed by a dab. Long touted as one of the underrated players in the division, this was a year in which it was impossible to ignore Dylan Best. His game is the type that doesn’t shine on the highlight reel; he ground out under cuts and poked holes in the defense with quick moves and short break throws. Yet when the dust settled in Milwaukee, there he was atop the assist column for the national runners up, including three in Pittsburgh’s shocking upset of Carleton in the semifinal. A second team All-American nod finally earns Best some long overdue recognition. A workhorse, a stopper, a leader… Sol Yanuck was many things throughout his CUT career, but he was never a disappointment. The defensive dynamo marshaled Carleton’s potent defense for practically his entire tenure, his lockdown handler defense and cool composure on the turn helped CUT to a dominant 2018 regular season. He’s the definition of consistency, and the handler that every defensive-minded Triangle Area youth aspires to be. Yanuck may stand only 5’11”, but on CUT’s defensive line you could’ve sworn he was as tall as Henry Fisher. The Carleton senior earns his second consecutive All-America nod, one of only three players to return from last year’s honorees along with Gouchoe-Hanas and Rees. 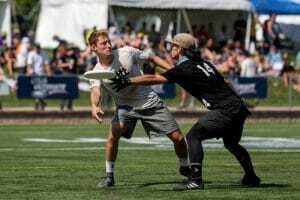 Comments on "D-I Men’s 2018 All-American Teams, Presented by Spin Ultimate & NUTC"